Growing up, it was always kind of confusing that most people, myself included, had little knowledge about what it means to be Chiu Chow Chinese. Whenever I'd get asked about my ethnic background, I'd say Chinese. The next question that would usually follow was "Mandarin or Cantonese? "; Neither, actually. This situation is something I think most Teochew Americans face growing up in the U.S. There is something about being Teochew Chinese that isolates us even among a group of Mandarin and Cantonese speaking Chinese people. We don't understand each other's dialects because our language among food, culture, etc is so different. During the first half of the Roots trip I sometimes felt like the mute foreigner waiting to get to my region. 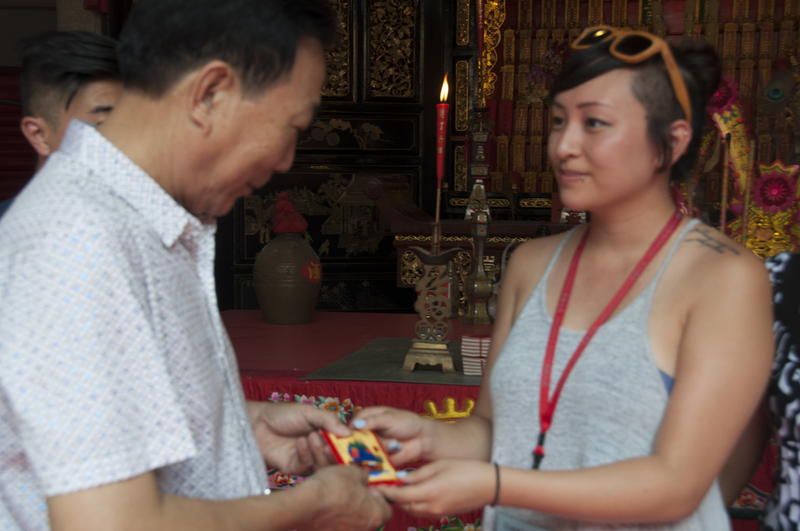 When I first applied for Roots, I never knew it would be a fateful four years later that I finally had the opportunity to take this journey to discover my family's roots in China. My oldest sister Myvan Ong was a part of Roots 2008. She was the first in our family to go to China and that was the first year Roots visited the Chao Chow region where our family is from. She chose to visit my dad’s ancestral village. When I was accepted, I chose to see my mom’s paternal side. Fast forward to the night before my rooting. My village was the very last rooting of the trip. I was nervous. After chasing a typhoon in an eight hour bus ride to get to the Shantou region, I had seen the rest of my roots family visit their ancestral homes, meet family, witness near magical experiences, and freely express their emotions. What if I don't feel the same meaningful experience that the other Rooters have? The night before my rooting I was asked what my expectations were. Our Roots leaders always say " Every rooting is different. You don't know what to expect til you get there". I wanted to keep my expectations low. I told our group that I heard that I have an aunt that lives in the village my great grandfather grew up. I thought if maybe possibly she's not too busy, I can have the chance to meet her. If there is an ancestral home, hopefully I can see it. Lastly, I've always been told that I look the most different from all the members of my immediate family. Everyone says that I get my nose from my grandfather, and I have a prominent nose bridge that neither my parents nor sisters have. If anyone could find a photo of my grandfather, I'd love to see if that resemblance was true. Day of my Rooting. As we enter the village of Chao An, I hear Al Cheng, Roots cofounder and leader exclaim "Wow! Look, a sign for you!" There is a tall metal framework in the canal, with a red poster and Chinese writing welcoming rooters. Then approaching the entrance to the village, a string of firecrackers is set off. Once the bus stops I see many anticipating faces just outside the bus. I see a short burgundy haired woman who looks so much like my mother's youngest sister in Vietnam. " I think I know who she is" I think to myself. I step off the bus and she calls me by my Teochew name phonetically pronounced "heoh swong”. Her name is pronounced “Xiang”. In Mandarin my name is Xiao Xuan, but my aunt chose to call me by Heoh Swong. She talks me in Teochew and tells me she is my aunt. Something about the fact that finally I was in a place where Chinese people knew how to say my name in my dialect made me feel good. With simply hearing my language spoken by so many in this village, it was the most “home” I've felt during the Roots trip. My aunt hands me two laminated photos. One side showing my grandmother celebrating her most recent birthday, the other side a young photo of my grandfather in his twenties. I look down and there I see it; that same nose bridge I see on myself even down to the small bump at the top of the nose bridge. Within fifteen seconds my lowest expectations have already been met. Following our arrival, we are being ushered by an entourage of villagers, arms linked with my aunt, and security following behind to my ancestral home. I feel so much excitement and make sure I ask Ty, my fellow teochew rooter to let my aunt know how happy I am to get to meet her. As we approach my grandfather's ancestral home, I learn that my grandfather, great grandfather and great great grandfather had all lived in this home. I linger on that moment, realizing I am standing where three generations of my family have lived. The doors are padlocked and I want to go inside the home. Unfortunately, I did not have the opportunity as my aunt and the village have something else planned for me. We walk hand in hand to the village temple where about fifty yards from arrival another huge string of firecrackers go off. I hear a live orchestra with village children playing different instruments. That day I heard a lot of comments remarking "low expectations huh Connie?". My aunt introduces me to an elder who grew up with my great grandfather. My great grandfather left China when he was thirty and took his son. He had a wife and a daughter that stayed back in China but took his son(my grandfather)with him to Vietnam to protect him from getting drafted. It was in this temple where the villagers point out my grandfather and great grandfathers names on the plaques in the temple shrine. I am proud and surprised that my family had such solid roots in this village. What a sacrifice my great grandfather took leaving this home, his village, community, and country where generations of his family had been a part of. I hold the three large incense sticks and bow three times to pay my respects and thank my great grandfather for his sacrifices and immigrating to Vietnam for a better life. I bet he never thought his descendants would end up in America. When I got back on the bus, it wasn't until twenty minutes later in the silence that I began to reflect. I thought of my mom, how before this year, before the roots program, I probably would have never thought it was possible to find or visit my ancestral village. I don't think anyone in my family would have considered it, yet here I am so beyond what I thought was possible and I wanted my mom to able to experience this. Now she can. Now we have that link. I've seen the house; I can bring her to see where her father, grandfather, and great grandfather came from. I see how these single decisions my ancestors made affect generations down the line. My family comes from China. My great grandparents immigrated from China to Vietnam. My parents immigrated from Vietnam to America. I am at a place in my life where I can choose where I want to live, not because of war, but because of freedom of opportunity. Wherever that takes me I know I have my ancestors to thank for it.